A line of pizzas ready to be picked up from the counter. 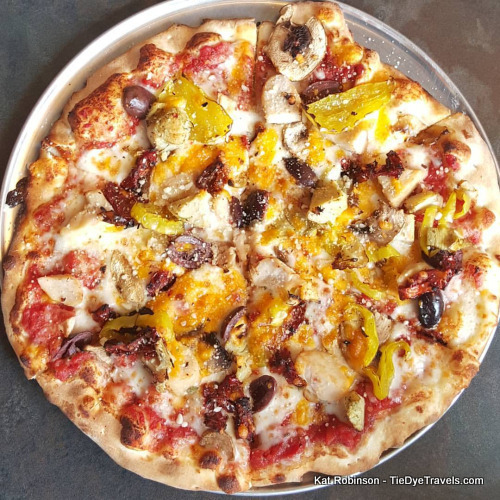 Pie Five Pizza has around a short while, but it has some deep roots. 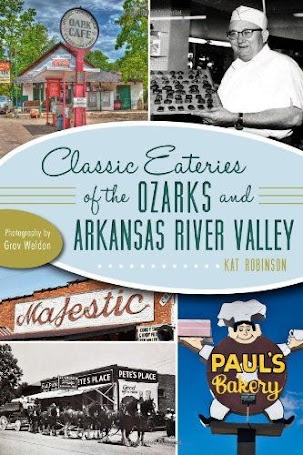 Its parent company, RAVE Restaurant Group, Inc. owns Pizza Inn (and for disclosure's sake, I'll mention here that I once delivered pizza for the Russellville Pizza Inn location, now a fire station). Between the two pizza franchises, RAVE has some 300 restaurants inside and outside the United States. 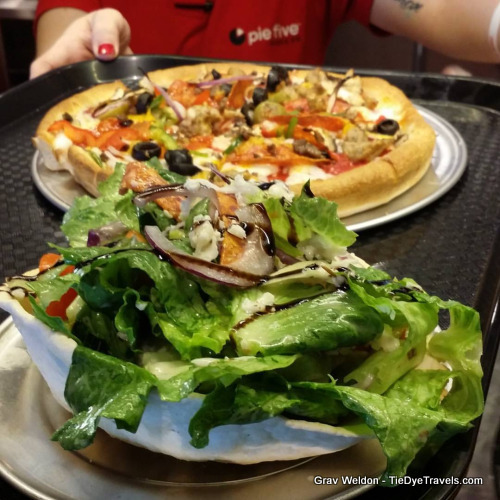 Pie Five Pizza operates in 19 states. 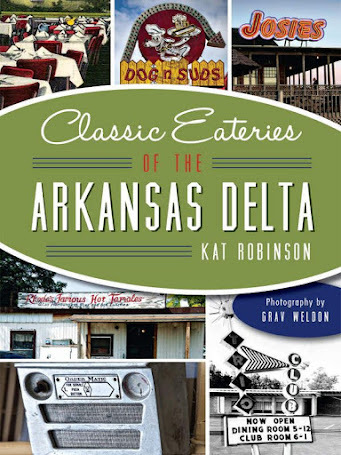 Benton's location, the first in Arkansas, is number 73. A Five Star pizza right out of the oven. The line is long for training day at Pie Five Pizza in Benton. 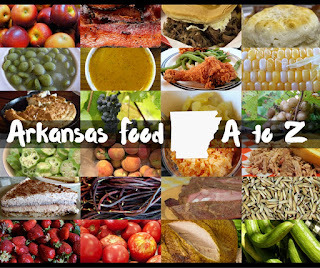 restaurants to this market over the past 20 years, and Runnells has extensive Central Arkansas experience, including a sting with Performance Food Group. room behind the counter. On Wednesday, with dozens of people showing up to try the place out, up to a dozen manned the counter, each quickly assembling and creating the pies. It’s called Pie Five because each pizza takes just five minutes to make - that’s assembly, bake time (2:25), sliced and serve. We had to try it out. I'll go ahead and mentioned, that five minutes is from when the order begins. When you have a crowd like we did, it may take a few minutes to get to the front. But it was pretty swift. There are menus at the front for your perusal, as Grav demonstrates here. This also speeds up the process. Yes, there are a lot of different toppings, and technically you could order them all, but that's sure a lot of toppings for one crazy pizza. what it looks like to make sure it's been made accurately. crusts are the only crusts at this location that aren't made in-house. Instead, they're shipped in, individually wrapped. When a gluten free pie is ordered, the person taking that order strips their gloves, goes and washes their hands for 30 seconds, returns, dons fresh gloves, opens a plastic-wrapped gluten-free crust, places it on a gluten-free only screen and assembles it without coming into contact with gluten items. Everything that goes on the pizza is gluten-free (except meatballs) and when it comes out of the oven, it's sliced at a separate station and boxed so it never comes into contact with gluten. Neat. Here's a video. As I mentioned, all the pies are made with whatever toppings you want. 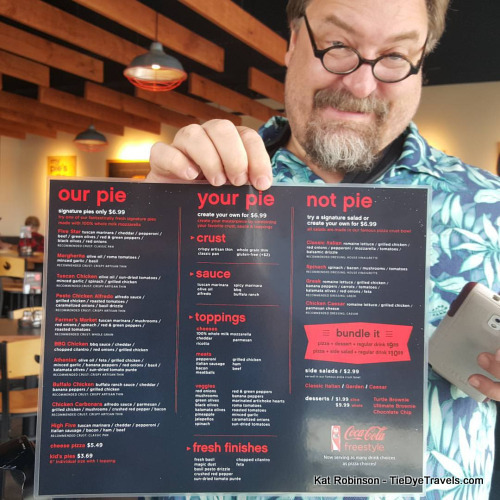 For testing sake, Grav and I tried a couple of the signature pies and a couple of make-your-own, choosing a different crust for each one. First Pie Five Pizza we tried was a make-your-own from Grav on Artisan thin with kalamata olives, banana peppers, chicken, sun-dried tomatoes, mushrooms, cheddar cheese and artichoke hearts on a Tuscan marinara sauce. The Artisan thin crust is very, very thin and comes very close to a saltine cracker in flavor. 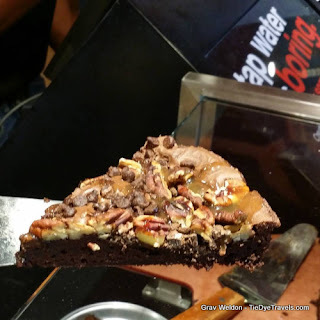 Thanks to Grav’s choice of toppings, this pie was also very salty. Our second pizza was the High Five on a gluten free crust. You will notice it is in a box. The pizza makers took extreme measures, with Grav’s pizza guy removing his gloves, washing his hands for 30 seconds, pulling out a wrap separate gluten- free crust and putting it on a separate clean screen, donning fresh gloves and taking great pains not to come into contact with anything containing gluten. For grins, Grav got his High Five, which includes cheddar, pepperoni, Italian sausage, bacon, ham, & beef with spicy marinara sauce instead of the Tuscan marinara, and had extra bacon added. He said he preferred the gluten free crust to the thin crust. This pie made him sweat. It was also his favorite. The third pie we sampled was the Athenian on classic pan crust. I was told by our pizza maker that this was the first Athenian he had made on this crust. 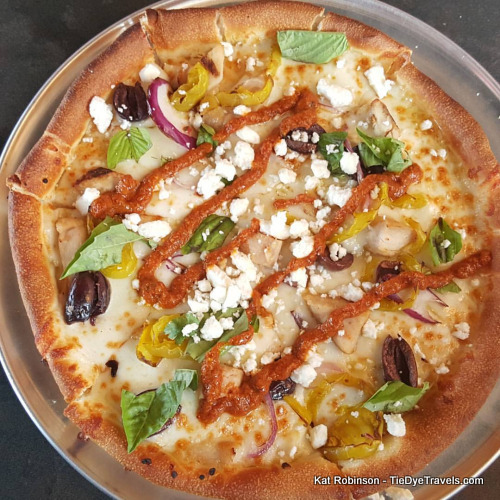 It’s a cheese blend, chicken, kalamata olives, mince garlic, banana peppers, red onions, basil, sun-dried tomato puree and feta cheese on an olive oil swept crust. I really liked this one, and I'll probably order it again. 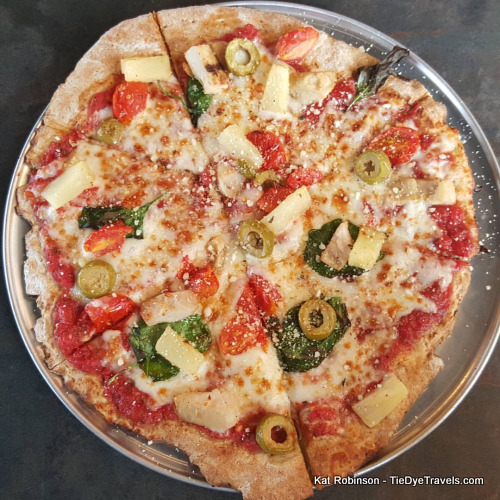 For number four, I went for my favorite toppings and got chicken, pineapple, roasted tomatoes, green olives, spinach leaves and Tuscan marinara on a whole wheat crust. While the crust wasn't really all that special, I loved the toppings. Chicken carbonara on Classic Pan. Every pizza at Pie Five Pizza in Benton is $6.99, including the signature pies and build-your-own. Cheese is $5.49 and a kids pizza is $3.69. bowls are edible -- they're made from a similar crust of the Artisan Thin, except baked in a bowl shape with olive oil and salt. They come out similar to a saltine cracker. The salads include a Greek, Classic Italian, Spinach and Classic Caesar. that cook everything that goes through them at 595 degrees for 2:25. This made the turtle brownie we tried especially gooey on the inside and very crisp on the outside. 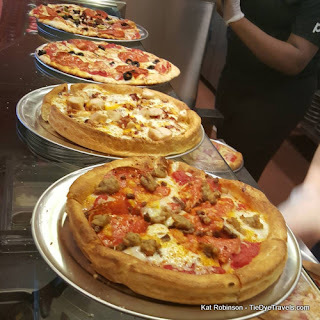 Pie Five Pizza also has one of those cool programmable Coke Freestyle machines that can make special recipes like Vanilla Root Beer Float and Dreamsicle... and, better for me, both unsweetened black tea and unsweetened Ginger Peach green tea. Sweet! Or not... ya, you know what I mean. The High Five on Classic Pan. 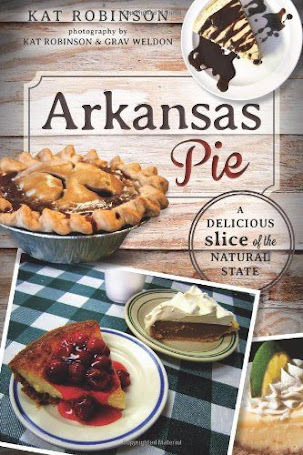 The new Pie Five Pizza is the first of eight locations expected to be opened in Arkansas in the near future. It's quick, there are a good variety of toppings and the interior is nice. The music's pretty sweet, too. If you'd like more information, check out the location's website here. It's located in the Hurricane Creek Shopping Center behind Academy Sports off the Alcoa Road exit on I-30 (near the new Kroger). Enjoy. Oh, and join the Circle of Crust for free pizza. and cheese blend on Tuscan marinara... on whole wheat. Tuscan marinara sauce on Artisan thin. 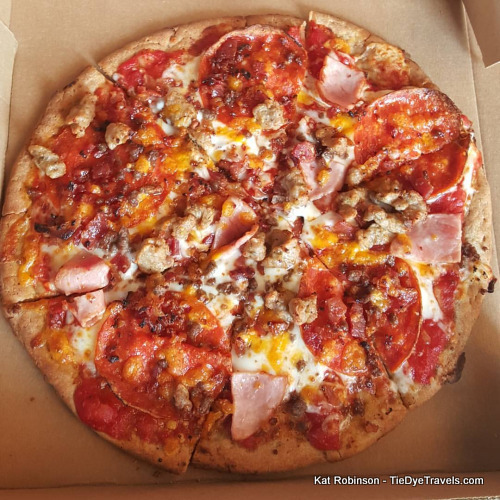 High Five with spicy marinara and extra bacon on gluten-free crust. Pepperoni and black olive on Artisan thin. This place is for real!! 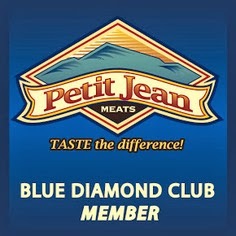 Really awesome pizza at cheap prices,and quick too. Just like Kat said!